Sweet Olive in Bloom Orange Blooms. Author and Image owner Dalton Quigley September 2012. 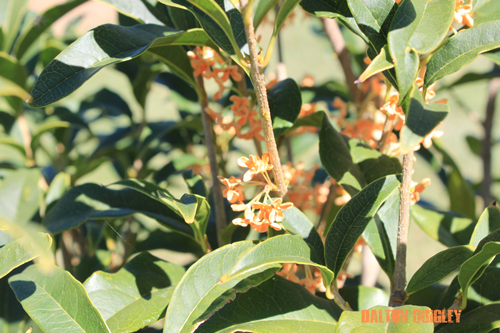 Amazing images of an Orange Blooming Sweet Olive. My Experience with Sweet Olive. I have seen them grown as a tree with a single trunk but of course this was in New Orleans La where the temperatures allow it to keep on growing. Most are grown as a multi trunked style. 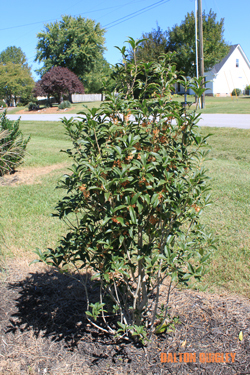 Osmanthus Fragrans size- 10′ tall possibly a little taller and 6′ to 8′ wide. Sort of columnar. This plant when seen most often has white and yellow small blooms. What zone does it grow in? This georgous plant smells like sweet tarts when in bloom. This plant works well near an entrance or some place where people walk so they will enjoy the fragrance. Zones 8 – 11. I hope you enjoy one in your future. Areas we go to are Nashville, Brentwood, Franklin, Spring Hill, and Nolensville TN. 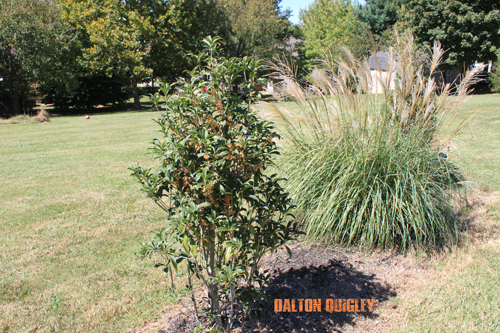 Call for information about if we go to your area to plant fragrant shrubs like Osmanthus ( Sweet Olive ). Contact us if you want us to design your landscape. Visit our Youtube Channel for great videos.